Master data is information that is key to the operation of a business. It is the primary focus of the Information Technology (IT) discipline of Master Data Management (MDM), and can include reference data. This key business information may include data about customers, products, employees, materials, suppliers, and vendors. While it is often non-transactional in nature, it is not limited to non-transactional data, and often supports transactional processes and operations. For example, analysis and reporting is greatly dependent on an organization's master data. 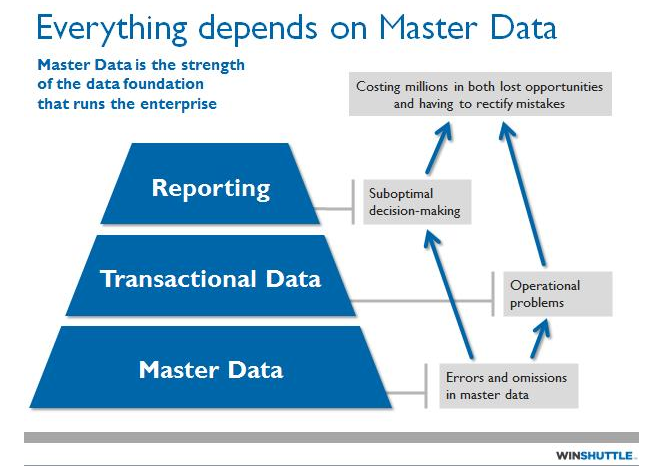 Because master data may not be stored and referenced centrally, but is often used by several functional groups and stored in different data systems across an organization, master data may be duplicated and inconsistent (and if so, inaccurate). Thus Master Data is that persistent, non-transactional data that defines a business entity for which there is, or should be, an agreed-upon view across the organization. Care should be taken to properly version Master Data if the need arises to modify it. The versioning of Master Data can be an issue. Is it handled like that? Do we ensure its quality? Do we maintain that it is clean and updated? Or do we just worry about it when it is already too late and the problem is not fixable in a timely manner? Every day millions of employees around the world make decisions based in their reporting, a lot of them using reports that are based on wrong or poor quality transactional data due to errors in master data. These decisions mean millions in costs and lost opportunities. When we talk about quality of our master data, we are talking about the quality of our business information. 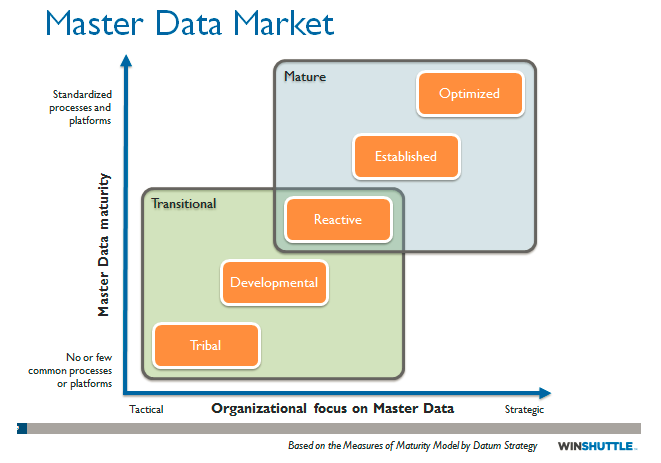 The first step to improving your organizations master data is to identify your maturity level. After all, we need to learn how to walk before we can run. Hence, your master data processes requires incremental improvements to achieve desired maturity. Tribal: This primitive level is characterized by ad-hoc and manual entry of master data. Often there is a lack of documented processes and standards and of formalized organization. Developmental: In this stage master data processing begins to take shape. Here, data standards are informally shared and request forms are typically either paper-based or sent via ad-hoc emails. Data applications, including the use of tools for mass master data updates and maintenance, are managed at a departmental level. Also, departments are usually siloed from each other, with data focus taking on a “transactional” nature. Reactive: The Reactive level includes mid-tier data governance processes, with data standards being documented and centrally managed in a document repository or database. Specific data governance projects, such as integrated master data workflow creation and maintenance, are funded and staffed. In this stage business rules are created and documented. Policies and procedures for creating and maintaining data are defined and documented. Established: A handful of companies have tackled their critical master data challenges head on. However, there’s always room for improvement. At the Established level of master data maturity they have integrated data standards, documented change-management procedures, and have a documented data strategy with well-defined quality metrics. With active data management, they leverage workflow dashboards, identify process bottlenecks, and monitor service levels and related key performance indicators to ensure consistent quality and productivity. Optimized: Organizations in the top 1% of the master data maturity pyramid belong to the Optimized category. These companies have a state-of-the-art data management platform that leverages optimized workflows for all types of master data. Such a platform, along with its underlying infrastructure, spans all use cases and supports a collaborative environment where both transactional and support documentation is maintained for flexible reference, auditing purposes, business-centric metrics, and proactive service-level management. These companies apply continuous improvement techniques, focusing on the Lean philosophy to increase efficiency and eliminate waste. A company’s level of master data maturity doesn’t depend on size or economic status. A company at the Tribal level of master data governance is unlikely to jump to the Optimized level in a single step. Achieving this goal requires not only appropriate aim across the organization, but also the right tools.